Unfortunately, it's one of those things which occur at night when we're on our own, relaxed and have nothing else to think about apart from all of the negative things which ideally you don't want to think about, but can't help thinking about! I've found the best thing to do when I'm over thinking is to share how I'm feeling with someone else. This someone is usually my boyfriend as he usually just tells me to shut up, chill out and get the hell over it and this usually helps! I just need someone to tell me that I'm being silly. However, it is also nice to have a close friend to talk too, who will listen and give advice on how to deal with the situation and this is what you really need when you are over thinking, especially if it's over something fairly serious. This is a fairly simple factor; counteract any negative thoughts with positive ones. If I'm over thinking about something which involves negative factors, I'll think about all of the negative points which comes from the situation as well. Usually the positive always over powers the negative anyway and the situation is sorted in no time! 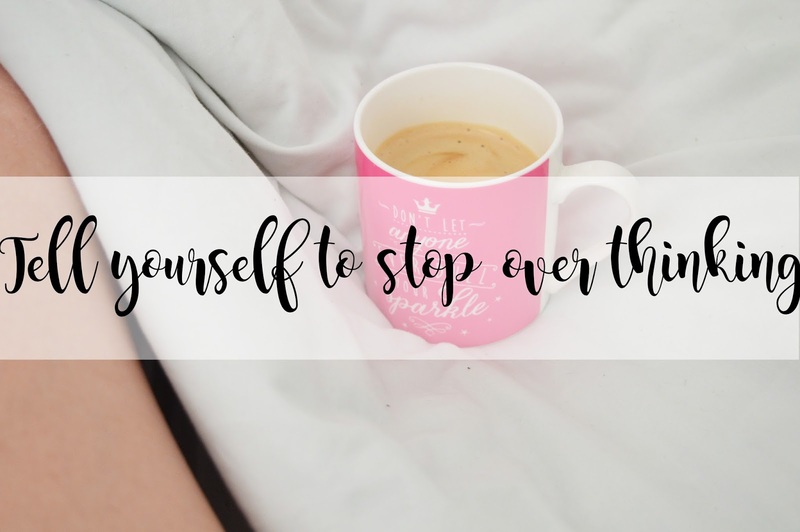 I am one for letting over thinking stopping me from achieving what I want as I'm too wound up about all of the things I have been thinking about to carry on and I really shouldn't let my thoughts do this to me, but I guess it's part of life! So I'm telling myself, and I'm telling you to stop letting these silly thoughts to stop you from achieving what you want. If you want to achieve something, then go for it and do not let anything get in your way! Also, another simple factor. Don't be so hard on yourself! You are doing the best that you can and the more pressure you put on yourself, the more you're going to over think absolutely everything! You are only human, you will make mistakes and this is completely acceptable and normal too! You may also feel indecisive about a situation as well, this is normal, especially in my life! Don't worry about it! Just because something went wrong yesterday, doesn't mean it also going to go wrong tomorrow. Tomorrow is there for a reason, so you can start over, pick up the pieces and get back up again to continue with your life! It's also a way of learning from any mistakes which may have been made yesterday. Just because something bad has happened, does not mean it will happen again! Over thinking is like standing outside with an umbrella waiting for it to rain, completely pointless! I've found everything I'm over thinking about is usually nothing and I stress myself out over something which hasn't even happened! Stop standing outside and waiting for it to rain, when it might not for weeks! What you're over thinking about doesn't matter now and it probably won't matter at any point! I've found I can stop over thinking by filling my mind with other things. I tend to do something which keeps my mind active, and exercising is definitely the best way to do this! Not only are you letting out all of the unnecessary energy which you have, but you're also letting your body and mind breathe! We all know exercise is good for everything, but not enough of us actually do it! As well as this, I like to watch movies, do University work and knitting is also a great winner for keeping my mind off any negative thoughts! What happened last time you were over thinking? I know whenever I over think, something bad happens! Is it worth over thinking, when there's always a negative outcome? Is it worth the pain and the negative emotions which are running through you? I don't think so and I'm sure you don't think it's worth it either! So stop the silly over thinking and feel the positivity! If you're an over thinker I hope these have helped you in one way or another! This is a lovely post and I can totally relate. I'm definitely an over-thinker, there's always what ifs and going over and over an event in my head. I learnt that talking to someone (usually my partner) helps, because I can see the event through somebody else's eyes. Doing sports, baking and reading also really clear my head. We need to find things we love doing and do them when we find ourselves dropping into the trap of over-thinking.